Staff members and state officials applaud Gov. Dannel P. Malloy after his announcement that he will not run for re-election. Gov. Dannel P. Malloy announced Thursday he would not seek a third term, setting the stage for a robust battle for the state’s chief executive post in 2018. Malloy, 61, who is embroiled in tough negotiations both with legislators and state employee unions to close major projected budget deficits, also insisted his lame-duck status would not be a hindrance and offered a word of caution to those who anticipate otherwise. “I will focus all my attention and energy. I will use all of my political capital from now through the end of 2018 to continue implementing my administration’s vision,” he told a packed room of staffers, legislators and lobbyists during an early afternoon announcement in a state Capitol hearing room. The governor, who has faced subpar public approval ratings throughout most of his tenure, pledged not shrink from unpopular decisions as he finishes his term. Malloy said that he has reflected “in stages” over the past eight months about what is best for himself and his family, the Connecticut Democratic Party, and the state. And that means continuing to press an agenda that, while difficult and often unpopular, has to take priority, the governor said. Malloy’s departure opens the door for several Democrats to consider a bid for the state’s top office. Lt. Gov. Nancy Wyman of Tolland, who stood at the governor’s side throughout the press conference, didn’t discuss her plans afterward. And Malloy wouldn’t speculate on what his longtime friend and running mate might do. “I love Nancy Wyman, and she’s got decisions to make,” he said. Besides Wyman, the potential Democratic gubernatorial field so far, according to many political observers, includes: Comptroller Kevin P. Lembo; Attorney General George Jepsen; Bridgeport Mayor Joe Ganim; Chris Mattei, former chief of the financial fraud and public corruption unit of the U.S. Attorney’s Office in Connecticut; State Sen. Ted Kennedy; and Middletown Mayor Dan Drew. On the Republican side, Danbury Mayor Mark Boughton, former U.S. Comptroller David M. Walker of Bridgeport, and state Rep. Prasad Srinivasan of Glastonbury are exploring bids for governor. The top Republicans in the state Senate and House, Len Fasano of North Haven and Themis Klarides of Derby, also are mentioned as possible contenders, though neither has formed an exploratory committee. Westport businessman Steve Obsitnik, who in 2012 ran unsuccessfully for Rep. Jim Himes’ 4th congressional district seat, has raised more than $100,000 in an exploratory committee for statewide office, but has not specified whether he is interested in the governorship or the U.S. Senate. Other Republicans mentioned include State Sen. Tony Hwang and Trumbull First Selectman Tim Herbst. Malloy also declined to weigh in on what role he might play in the 2018 campaign. “I have never been shy about politics, and I’m sure I will continue to play a role,” he said. Senate Majority Leader Bob Duff, D-Norwalk, said the governor’s decision will help many candidates who face the arduous task of raising the numerous small contributions needed to qualify for public financing in the 2018 gubernatorial campaign. “With the public financing that’s out there right now, it does take time to assemble the amount of contributions and money … so I think he did need to make some sort of a decision,” Duff said. Malloy was uncertain how labor negotiations would be resolved, but hinted he would impose layoffs — without using that word — if no deal is struck. “I don’t even think I need to assure you I will act,” he said. Does his lame-duck status make it easier for legislators or unions? “It probably makes it harder for others,” the governor responded, implying he doesn’t face the pressure of public approval that politicians seeking election in 2018 must confront. Malloy, who inherited one of the largest fiscal messes in Connecticut history when he first took office in January 2011, said his task has been to confront problems that his predecessors ignored for decades. Outgoing Gov. M. Jodi Rell and the 2010 General Assembly had propped up billions of dollars in ongoing programs with borrowed funds, emergency federal grants and the entire balance of a nearly $1.4 billion state reserve. As a result, state finances were on pace to run nearly $3.7 billion in deficit — a gap of more than 18 percent — during Malloy’s first year. The administration would win legislative approval of a “shared sacrifice” plan to avert that deficit, relying on a tax increase of more than $1.8 billion — the largest in terms of dollars in state history — as well as the most sweeping union concessions plan in modern times. Malloy would shield the state’s entire $3 billion municipal grant program from any cuts while dramatically increasing state payments into the long-neglected state employee pension fund. Still, the third component of that “shared sacrifice” blueprint, a recovery that would match or exceed Connecticut’s economic growth in the mid-2000s, came up short. As a result, Malloy would struggle with sporadic deficit forecasts throughout that first term. And after winning re-election in 2014, he would close the first two fiscal years of that new term with modest deficits. He hit a low point in the Quinnipiac University poll in June 2016 with a 24 percent rating. Former state Rep. Michael Lawlor, an East Haven Democrat who has been Malloy’s chief criminal justice policy advisor since the administration began, said Malloy brought a courage and dedication to the job that was essential for success at this time. “I don’t know how we could have been any more successful than we are right now,” Lawlor said, citing historic lows in crime rates and downward trends in prison population and recidivism. “I know that commitment will continue every day. I know that won’t stop now,” said Dianna Wentzell, his education commissioner. Senate Republican President Len Fasano said, “While we may not always see eye to eye, I respect him greatly for his tireless work ethic and dedication to Connecticut. 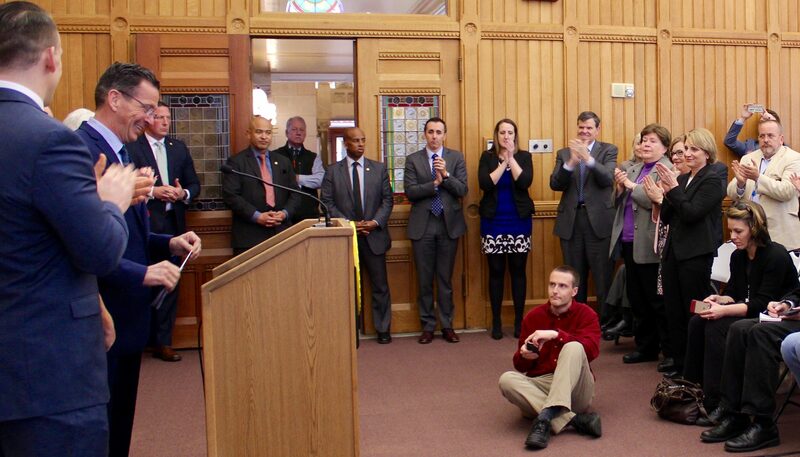 Governor Malloy has led our state during some of its most difficult times and enormous economic challenges. He has governed when our communities had to rebuild following devastating storms and when we all had to heal following unspeakable tragedy. U.S. Sen. Chris Murphy, a Democrat, thanked him for the work he has accomplished. What’s next for the Malloys? Malloy said he has not decided what’s next for him but is looking forward to spending more time with his family and taking up new hobbies, including skiing. Standing next to his wife Cathy and son Dannel, who was recently married, he joked he also is looking forward to having grandchildren, hopefully in the near future. “No pressure,” his son joked in response. Malloy became choked with emotion at several points throughout his announcements. Smiling and sighing with relief at points, Malloy described his decision not to seek a third term as a gradual realization that began last year, but had to be revisited repeatedly before he felt certain. He recalled his first campaign for governor, which began in 2004 — two years in advance of the 2006 state elections. Malloy, who was mayor of Stamford from 1995 through 2009, narrowly lost the Democratic gubernatorial nomination in 2006 in a primary against New Haven Mayor John DeStefano. Malloy would come back four years later, capturing the nomination in a primary win over Greenwich businessman Ned Lamont before narrowly defeating Greenwich Republican Tom Foley in the general election. Malloy would win the 2014 rematch with Foley but by a slightly wider margin. That race would be marked by a very contentious campaign as both candidates struggled with poor voter approval ratings in the polls. Malloy said becoming governor exceeded his wildest expectations. “Who would have thought that a kid who was spastic when he was young, was thought to be mentally retarded, whose wife had to type all of his papers, effectively…” Malloy said, then paused. As he teared up his wife stepped up to finish the thought. “And went on to be governor and mayor, and it is the best job ever, and we loved every minute of it, but it is a new chapter, and we are moving on,” said Cathy.